Rest in peace Detective Brewer! Friend Of All Law Enforcement Officers! I am sad to learn of the passing of a brother and hero in Detective William Brewer. I believe our Heavenly Father has welcomed him home into his loving arms where he will now patrol the Golden Streets of Heaven. May the Lord deliver blessings, comfort and peace to his family, friends and members of the Clermont County Sheriff's Office. To the family of Bill Brewer, your sacrifice and pain is far too immeasurable to comprehend. May God grant the strength to bear you through and beyond. Rest in the knowledge that Bill's life was most honorable and his death, the most noble. To my fellow comrades: let us continue to live out our lives and careers to the fullest, serving God and our community sacrificially. Never forget the price that Bill paid that we may do so. May God bless you and your family. You paid the ultimate sacrifice. May you rest in peace my brother in blue. I'm so sorry for your loss. I hate that people are so disrespectful to men and women who put their lives on the line to protect everyone and yet some people don't give a damn! Thank you for your service. God bless you and your family. RIP! On behalf of POINT 27, we would like to offer condolences for Detective William Brewer. Please know we are eternally grateful for William’s service and his ultimate sacrifice. To honor Detective Brewer, POINT 27 sent 27 Thin Blue Line Dog Tag Necklaces, engraved with “Blessed are the Peacemakers for they will be called children of God” Matthew 5:9, to the Clermont County Sheriff’s Department for William’s partner and fellow officers. POINT 27 sent Folded Flag Necklaces engraved with “Greater Love has no one than this; than to lay down one’s life for one’s friend” John 15:13 for Detective Brewer’s wife and son. POINT 27 is a Non-Profit organization with a mission to strengthen and encourage members of the Armed Forces, First Responders, and their families, by sharing scripture on Dog Tags and Jewelry called Shields of Strength. We will never forget and we are forever grateful. May God welcome you with open arms. Thank you for your service. May you Rest in Peace my Brother! Prayers sent for Det. Brewer and his family and my condolences to the brothers and sisters of the Clermont County Sheriff's Office. Godspeed Det. Brewer. I am sorry for your loss to the Family, Fellow Officers, and Friends. I will keep all of you in my prayers. RIP. 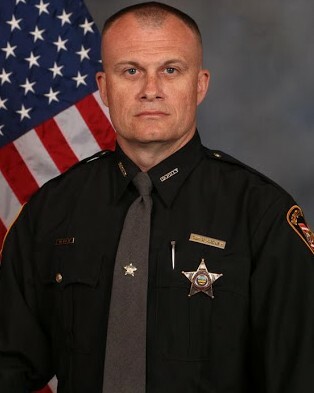 Lord God, our hearts and prayers go out to the Clermont County, Ohio Sheriff’s Office and for the family, friends, and colleagues of Detective William Brewer, of the Clermont County Sheriff’s Office, who was shot and killed in the Line-of-Duty on Saturday, February 2, 2019. Father God, have mercy on us and their souls. Rest easy my Brother-in-Blue. We will take it from here! Now, join the Lord and rejoice in Paradise! God speed! Amen. Pastor Steven R. Closs, D. Div. Rest in peace, Detective Brewer. You deserve your divine reward. May God comfort your family, friends, and fellow officers at this difficult time. May God stand in the gap in your absence, surrounding your son with an extra measure of love and protection. My family and I would like to extend our sincere condolences to the family, friends, and fellow co-workers of Detective William Brewer during this difficult time. May they find comfort and support from those around them. May happy moments from the past bring forth precious memories to cherish for a lifetime. May God help heal their aching hearts. Thank you for your service and may you rest in peace Detective William Brewer. ★ Rest in peace and God speed... May St. Micheal carry you to the Heavenly throne. Thank you for your Service and Sacrifice... Slow Hand SALUTE! Thank you for your service Detective Brewer. May God comfort your family of red and blue. Greene Co. OH Sheriff Dept.